According to Phocuswright's recently published Australia-New Zealand Online Travel Overview, improved performance for airlines – driven by a steady economy, increased traveler movement and the strengthening of local currencies – propelled the Australia-New Zealand (ANZ) travel market to grow a projected 5% in 2018. With online penetration of 44% in 2018, ANZ is one of the most mature online travel markets in Asia Pacific, though offline travel agencies remain a critical channel for complex leisure itineraries and packages in addition to business travelers. The number of domestic air passengers saw a modest increase in 2016 and 2017 after three flat years, according to The Bureau of Infrastructure, Transport and Regional Economics (BITRE). Additionally, capacity correction coupled with the end of fare wars in the domestic market proved to be a boon for all carriers. Qantas is now trying to grow its overall market share by focusing on the small to medium enterprise (SME) market. Virgin Australia posted a strong 2017 and is the only serious competitor to Qantas in the leisure segment. Traditional airline revenue accounts for the vast majority of gross bookings, but the incursion of Asian LCCs, especially on international routes, is slowly changing the equation. Accounting for 35% of ANZ's total travel market in 2018, lodging is projected to be the fastest-growing segment. Rising domestic business travel, a major source of business for hotel chains, is further buoying the sector. Demand is growing faster than supply, leading to high occupancy levels and increasing ADRs. Travelers prefer self-drives to cover some of Australia's vast distances, in contrast to many South and Southeast Asian countries where travelers opt for chauffeur-driven vehicles due to insurance, language, license and infrastructure limitations. Global car rental brands like Hertz, Avis/Budget and Europcar dominate the ANZ market. 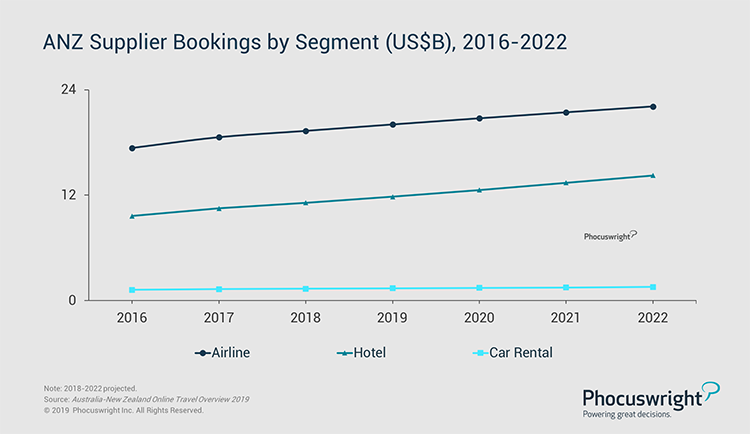 Although increased tourism has largely benefited car rental companies, the growing popularity of ride-hailing companies (e.g., Uber, GoCatch and Ingogo) and car-sharing services (e.g., GoGet, GreenShareCar and Flexicar) is acting as a headwind for the industry. The ANZ OTA landscape is dominated by global brands Booking Holdings and Expedia. These travel powerhouses have deep pockets, offer superior booking experiences and have been investing heavily in advertising in ANZ. They have succeeded in capturing a considerable share of the online market both organically and through acquisition (Expedia acquired Wotif in 2014). Webjet is the only independent domestic OTA still in the game. Webjet has been experimenting by diversifying its product lines to maintain its growth momentum in the highly competitive landscape. ANZ has a very strong presence of traditional travel agencies, which represent serious competition to OTAs with their multichannel approach via retail stores, call centers and online. Travel agencies have been ramping up their online presence and booking capabilities in recent years to meet market demand. A consolidated air market restricts the growth – and relevance – of metasearch in ANZ. Still, metasearch websites have not shied away; they bring value to travelers by aggregating relatively complex and fragmented hotel and international air products. They also help online businesses that lack the budget to compete with Expedia and Booking in advertising. Traditional agencies in particular stand to benefit from metasearch websites as they get enhanced visibility and customer attention through these sites. To gain a a top-level overview of the Australia-New Zealand travel market, including background, key characteristics, market structure and major players in each segment, download the full travel research report here. Or subscribe to Open Access to unlock Phocuswright's extensive research library for your entire company.